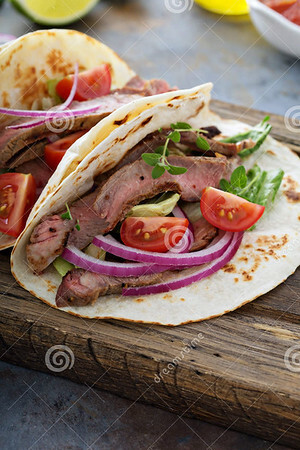 On My Menu: The Best Steak Fajitas! We have made these steak fajitas from Mel's Kitchen Cafe a few times already since discovering them only a couple weeks ago! My grocery store sells "stir-fry steak" that is already cut into thin strips so it makes this the easiest and most flavorful meal! I get the meat marinading the day before and then we grill them up right before meal time and the flavor is out of this world. I haven't even ever made the chipotle sour cream that she included in the original recipe. I sautee some onion and peppers that have been cut into strips and we also top them with guacamole and cilantro (and a little cheese for some of the family). We have charro beans on the side with some chips and salsa and it has become my kids' favorite meal of the week! For the fajitas, whisk together the oil, lime juice, vinegar, garlic, sugar, cumin, salt, paprika, and coriander. Place the steak in a dish (like a 9X13-inch pan) and pour the marinade over the top, turning to coat. Cover and refrigerate for at least 8 hours or up to 24 hours. Preheat grill to medium-high (I set my pellet grill to 375 degrees). Grill the steak until desired doneness; 4-6 minutes for medium rare (add time if needed for a more well-cooked piece of meat). Remove the steak from the grill and tent with foil for 5-10 minutes before slicing and serving. For the chipotle sour cream, stir all the ingredients together. Cover and refrigerate (can be made 2-3 days in advance). Serve the steak slices on tortillas with the chipotle sour cream and any other favorite toppings or sautéed or grilled peppers and onions.